Your browser does not support the video tag or your flash player needs to be upgraded. The road of life is filled with important milestones – major events and achievements that help to define who we are and what’s important to us. Events such as graduation, marriage, childbirth, and retirement are universal moments that bring families together to celebrate those significant accomplishments that required careful planning and financial commitment. But what about funerals? Where do they fit on the list of life’s milestones? Many people are hesitant to include funerals when discussing other important life moments because talking openly and honestly about death may be considered taboo. As a result too many well-intentioned friends and family die unprepared, leaving their loved ones with a painful emotional and economic burden. The average family has to answer over 150 detailed questions within 48 hours of losing a loved one. Most must make these decisions with a heavy heart and very little time to think about details and prices. With average funeral costs approaching $10,000 – and rising – families can be left in a difficult predicament if caught unprepared. Like the rest of life’s major milestones, funerals require detailed, deliberate logistical and financial planning. Think about a wedding, for example. How many weddings are planned in two days? People spend a year, on average, planning the details and saving for their wedding day. They take time to really think about all kinds of specifics: what kind of clothes they want to wear, what kind of music they want played, who should be in their wedding party, which flowers they should have, where the ceremony should take place, and, of course, how they should pay for it all. It’s an important event in a person’s life that shouldn’t be and almost never is planned on the fly. A funeral should be the treated the same way. Some take the step of creating a will, which is a good way to plan for their belongings, but a funeral service is so much more than distributing property. It’s a reflection of a person’s legacy and an opportunity for bereaved friends and family to come together to begin the healing process. By taking the time to prearrange all the details of their funeral, one can ensure that it will be an event that truly represents their life and also serves as a responsible, thoughtful gift to their loved ones. Funeral preplanning is the missing milestone and should be an important part of everyone’s long term blueprint. In addition to prearranging, many people also opt to prefund their funeral because it locks it today’s prices and saves family members from financial burden. With inflation causing funeral prices to nearly double every 10 years, prefunding is a smart, economical choice. Multiple payment plans exist to fit a variety of needs. The immediate benefit of preplanning is the peace of mind that comes with being prepared. Your wedding wasn’t planned overnight and neither should your final wishes. Prearranging and prefunding your funeral is a smart investment for your family that they’ll always remember. You’re never too young or too old to make preplanning the next milestone in your life. 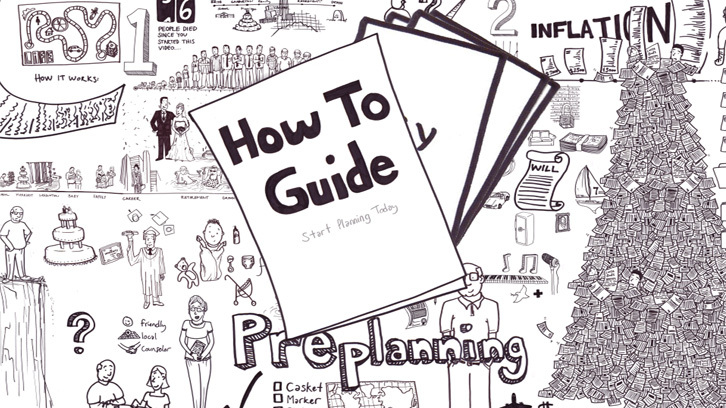 Start today by downloading our free How To Guide. Don’t delay. Take the first step to providing peace of mind to you and your family. Prevent over-spending and give your loved ones the opportunity to remember you how you want to be remembered. Download our free How To Guide to learn more. You’ve always strived to do things the right way in your life. Your good judgment, determination, organization, and passion have helped you find success in both your professional and personal life. You’ve worked hard to build supportive, loving relationships with your family and friends. Now you’re thinking about prearranging your funeral because you want to do what’s best for your loved ones and for yourself. Kathy Grahn considers herself to be pretty lucky. While many people might only see their grandparents on holidays or the occasional weekend, she was able to visit hers almost every day growing up in small-town Stayton, Ore. As a matter of fact, her grandparents, Harold and Grace, lived just down the street and were a part of her daily life. She forged a special relationship with them that’s never diminished.